Q. How do students access items on Reserve (Electronic/E-Reserves, Physical Reserves and CourseMedia)? 2) Login using your DU ID number and password (the same as you use for PioneerWeb). 3) Select the course from your Dashboard. 4) In the left-hand panel of the course screen, locate the link titled “Modules” and left-click on it. 5) In the center panel of the course screen locate the “Course Reserves” module. 6) Left-click on the “Ares Course Reserves” link. 7) After a brief moment you will be taken into the Ares Course Reserves system page for your course. Click on any document title to access it. ARES is the current system housing your courses’ electronic reserve items, via a link in the Canvas page for your course. 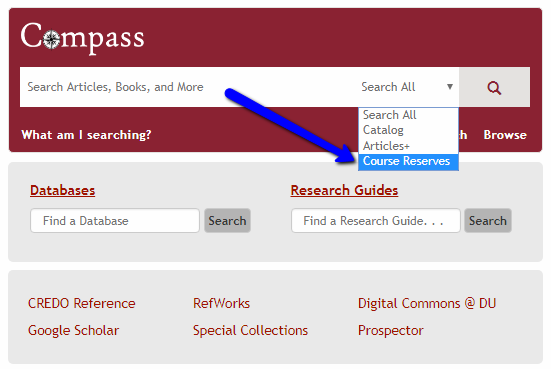 Selecting the appropriate "Course Reserves" option from the drop-down menu, search Compass from the library's homepage by course, professor, title, or call number to see if it is available for checkout. Check Out is available at the Main Library Lending Desk. If your course/professor is not listed, please contact your instructor. DU CourseMedia is only available to you if your professor has requested a video for your course. Access will normally be through your class's Canvas page. If a login is necessary, use your DU ID number and passcode (the same as that which one uses for PioneerWeb). Error message upon login? No video is available at this time. Please speak with your professor. E-Reserves and DU CourseMedia are controlled by course enrollment. If you experience difficulties, please speak with your professor and have them contact Reserves, reserve@du.edu.